There’s so much more to fall lawn care than simply raking leaves. 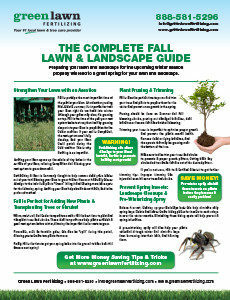 In fact, experts say what your lawn looks like next spring depends a great deal on what you do with it now. Fertilizing and liming is a must in the fall months. You have to provide your lawn with the essentially nutrients prior to dormancy. 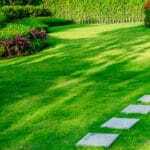 However, doing these things alone won’t guarantee a perfect spring green-up. We’ve listed the top 5 fall lawn care tips to accomplish over the next week or so to help ensure a healthy, green lawn next spring. 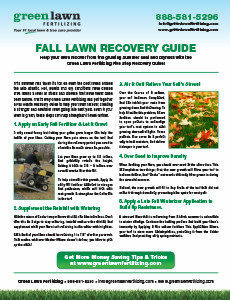 Aerating your lawn is fall lawn care must. If you’re a “do-it-yourselfer” when it comes to home improvement and lawn care maintenance; you can rent an aerator a local stores to save money and do-it-yourself. 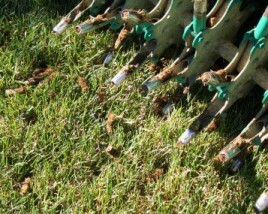 HGTV Gardens suggests using a garden fork to spike holes all over the lawn’s surface (you can also rent or buy Aeration spiked shoes). HGTV also recommends applying horticultural grade (dry, fine) sand into the holes to prevent them from closing up and allowing air and water to pass freely into the root zone. Spread top dressing using a brush or back of the rake to work dressing evenly into the grass. However, if you’re looking for a professional Aerating services with a company that offers a guarantee give Green Lawn Fertilizing a call and take advantage of their $100 off Aeration and Seeding Special. If you live in the Philadelphia tri-state area we recommend you overseed with Rye Grass and Tall Fescue. 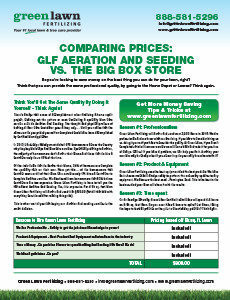 Germination for these cool-weather grass seeds ranges from 10-30 days. Both promote green color, thickness and vigor. It’s vital to overseed because worn-out lawns invite unwanted guests such as diseases and weeds such as crabgrass. Overseeding is a fast, simple and inexpensive way to bring your lawn back to life and gain the thick, lush green lawn you’ve missed. 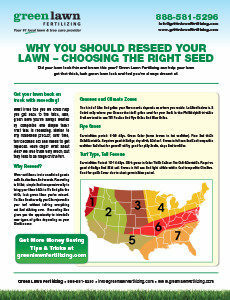 Reseeding can be useful if you’re looking to rejuvenate your turf without tearing everything out and starting over. 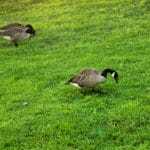 Fall is the time when grass grows more frequently similar to the spring. As a result you may need to mow more than once a week to keep up. Continue mowing your lawn as usual for now. However, pay close attention to the temperature and try to plan out your last two mows in advance with the weather. As soon as fall comes to a close, adjust your mower’s blades to the lowest setting for the last two mows. According to Popular Mechanics, make sure you aren’t trimming down more than one-third of the grass blades. This allows sunlight to reach the crown of the grass. 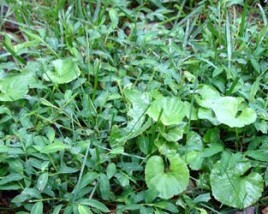 It’s still a good time to consider a weed control program while the lawn is actively growing. Knowing when to kill your weeds in the fall is essential to the success of other fall lawn care activities such as overseeding. If and when you apply weedkiller, make sure to allow up to two to three weeks leeway before putting seed down. Apply this leeway time if you overseed before applying weed killer as well. We recommend you continue to use a broadleaf weed killer. There’s nothing more aesthetically pleasing than a beautiful, green landscape that includes trees. Fall is the best time to plant and grow trees. It’s better than summer, because similar to your lawn, trees don’t like the stressful summer temperatures and droughts. If you consider planting dogwoods, redbuds and deciduous trees now is the time! Moreover, you can plant nearly any tree or shrub all through the winter. 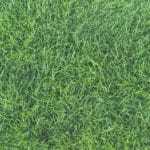 If you follow these fall lawn care tips you can be sure your lawn will head into winter dormancy ahead of the rest on block. Furthermore, your landscape will be looking green as can be come next spring!